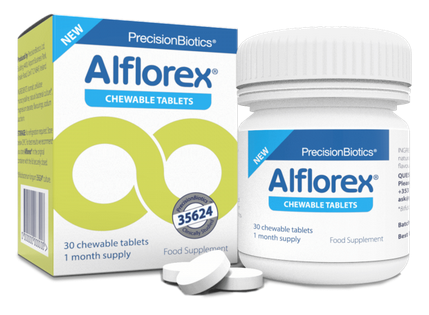 Alflorex is a probiotic supplement manufactured by PrecisionBiotics that contains one patented and trademarked probiotic strain scientifically known as Bifidobacterium infantis (B. infantis) 35624. It is the only product in the UK and Ireland that contains this strain at this time. The names of the product and 35624 are registered trademarks of Alimentary Health Ltd., a company based in Ireland. Marketing materials say it "is the #1 Gastroenterologist recommended probiotic culture in the U.S.” This claim is based on a survey performed in 2017 among doctors and/or gastroenterologists who recommended a brand of probiotic by a human data service company, AlphaImpactRx. Marketing materials also state that it is the winner of awards from Irish pharmacists and industry experts, who voted it the winner of Best Gastrointestinal Product for 3 years in a row at the Irish Pharmacy News OTC (over-the-counter) Awards. There are 3 different formulations of this probiotic supplement as of January, 2019: capsules, straws, and chewables. Please always read ingredients before taking any supplement! The ingredients may vary depending on the date they are manufactured and depending on the country they are manufactured in or for. This review is for products in Ireland. As of January, 2019, the capsules contain 1 billion CFU of Bifidobacterium infantis 35624 at time of manufacture. Other ingredients are corn starch, hydroxypropyl methyl cellulose, magnesium stearate, and titanium dioxide. 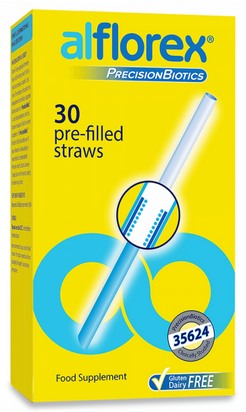 The children’s straws (for ages 3 and older) contain rapeseed oil and the probiotic. They, too, contain 1 billion CFU of Bifidobacterium infantis 35624 at time of manufacture. The straws are individually wrapped in foil and extend once pulled upon. The 35624 culture is suspended in the oil droplet in the straw at the blue end of the straw. The blue end should be placed in a cool liquid. Acidic beverages such as fruit juices should not be used with these straws, but water and milks (cow and alternative milks) are acceptable. Note that as of January, 2019, the straws are being phased out and will be replaced by new Alflorex Chewables. The chewables are said on the website to contain isomalt (a sugar-alcohol sweetener), microcrystalline cellulose, magnesium stearate, unidentified flavorings, and sodium saccharin. They are dairy-free, lactose-free, soy-free, sugar-free and vegetarian. They, also, contain 1 billion CFU of Bifidobacterium infantis 35624 at time of manufacture. What is the Recommended Dosage of Alflorex? The manufacturer's recommended dosage is 1 Unit (capsule, straw, or tablet) per day for each product. What Are Some Reviews of Alflorex? 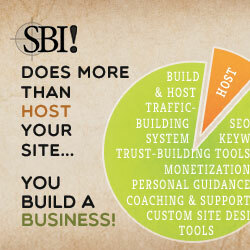 The reviews on the PrecisionBiotics website show all 5-star reviews. On Amazon UK, Alflorex has 4.1 out of 5 stars from 144 reviews as of April, 2018. “My wife has suffered from IBS for years and often cannot leave the house, after a week of this the results are amazing. I am sure it may not work for everyone but after about 30 years of problems it has worked for my wife. Is Alflorex the Probiotic Supplement for YOU? If you want to determine if this probiotic supplement can help you, read my book about what the research shows for the probiotic in Alflorex, Bifidobacterium infantis 35624. Purchasers of the book also have free access to the pros and cons of Alflorex as I see them. For less than the average cost of ONE month’s supply of Alflorex you can know what the research actually shows and whether or not it may help you. 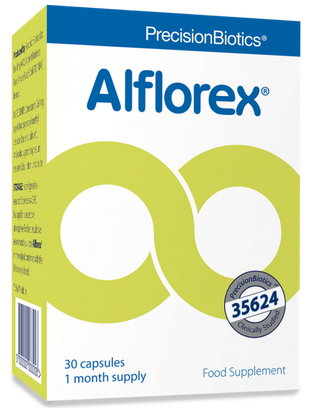 Note that Alflorex contains the same 35624 as the Align supplement sold in the US.